Faculty and students are the heart of the university's mission, and IT is committed to supporting instructional technology needs. Here is information on technical resources available for enhancing your teaching at George Fox. View resources by function (I want to...). Learn about and discuss emerging technologies. George Fox University strives to make teaching preparation as smooth as possible. 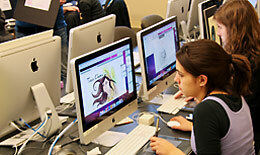 Our media-enabled classrooms are a step in that direction. There are many media-enabled classrooms on the Newberg campus, and all classrooms on the Portland campus are equipped with LCD projectors. You may request additional classroom equipment or assistance with audio-visual instructional materials (loading DVDs online, how copyrights work, etc.) from Media Production Services. Gloria Doherty (503-554-6128, gdoherty@georgefox.edu), Director of Hybrid Learning Programs, is currently the contact for faculty who are interested in getting assistance with technology for teaching purposes.